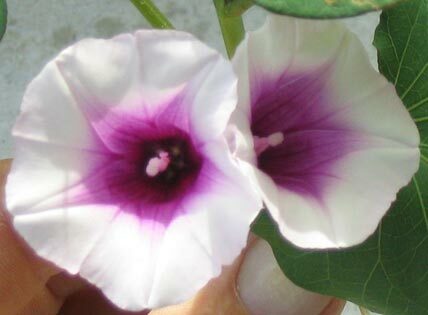 Ipomoea batatas, Convolvulaceae (see separate etymologies of some varietal names below). 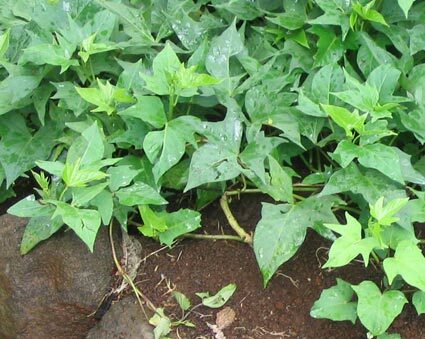 From PROTO EASTERN POLYNESIAN *Kumara, Ipomoea batatas, possibly from a coastal Quechuan language, but see discussion in text, below. PROTO POLYNESIAN *Kanawa "Cordia subcordata [Boraginaceae]", from PROTO MALAYO-POLYNESIAN *Kanawa "Cordia sp." through PROTO OCEANIC *Kanawa ~ *Kanawan "Cordia subcordata"
pongi (also the name of a dark variety of taro), from *pongi (Proto Polynesian) a dark variety of Colocasia esculenta [Araceae] (taro). pōhutukawa (primarily the name of a large coastal tree with bright red flowers), from *pōfutukava (Proto Rarotongan/Māori) "a seaside tree". Kumara were almost certainly introduced into Eastern Polynesia from Peru or Colombia as the result of an expedition setting out from the Marquesas, Tahiti or Easter Island very early in the settlement of Eastern Polynesia. Interestingly, although Easter Island may have been one of the starting points for a Polynesian expedition to Peru (the Mangareva [Gambier Islands] area is another strong possibility), the expedition would have returned to the Marquesas/Tahiti heartland of Eastern Polynesia, from where the kumara was dispersed quite rapidly to the periphery, and, much later, further afield. There is strong evidence that the kūmara reached Aotearoa not long after it reached the heartland, and at least a century before it was taken to Rapa Nui. It did not reach Western Polynesia until centuries later, when Mexican varieties were introduced the camote into parts of the Pacific and Southeast Asia by the Spanish and Portugese, and other voyagers took the Eastern Polynesian kumara westward. Some of the Mexican-derived varieties were adopted by Māori in the late 18th and 19th Century, and because of their larger size and greater productivity soon eclipsed the older varieties in many places. The traditional Māori accounts of the origin of the kūmara are summarized and analysed in an article by Serge Dunis in The Sweet Potato in Oceania (2005 -- see the bibliography for the complete reference). 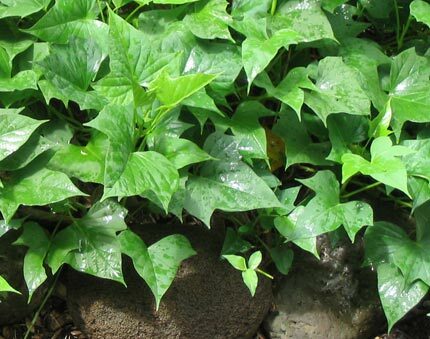 Many of the symbolic mythological accounts involve Pani, who gives birth to the kumara; others are historically oriented and associate the discovery and subsequent introduction of kumara with Toi or his descendents, either from Hawaiiki or from a distant land where it is growing. None of these narratives is incompatible with a South American origin for the kumara and its direct acquisition from there by Polynesian exploratory voyagers. In 2018 Professor Robert Scotland from Oxford University and associates published a paper challenging the generally accepted hypothesis of a late introduction of the kumara into Eastern Polynesia by human agency (Pablo Munoz-Rodriguez et al -- see bibliography for reference). They examined a sample of kumara collected in Tahiti during Captain Cook's expedition of 1769. The researchers concluded that the genetic signature of this variety is found only in Polynesia, and the genetic data suggest that it diverged from other American varies more than 100,000 years ago. It appears that samples of this variety have not been found in the Americas. 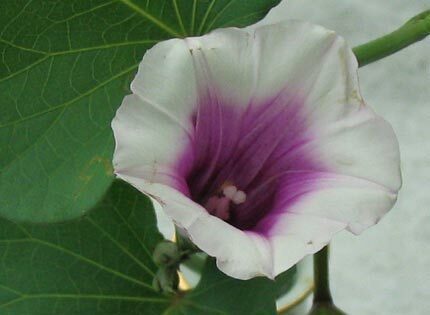 Furthermore, they have established that tubers and seeds of species within the genus Ipomea can and have been carried by sea for long distances, and have naturalized themselves in new environments, sometimes evolving into new species. In Hawaii, for example, the endemic species I. tuboides, clearly seems to belong to a group originating in Mexico. Because of this, they see no reason to assume that I. batatas, the kumara, did not arrive in Polynesia by the same means. It seems to me, however, that it is equally likely that although Captain Cook's variety may now be found only in Polynesia, it may just as easily have been a then rare cultivar collected from Peru 1,000 years ago, looked after more carefully in Tahiti than at home, and have since died out in its country of origin. 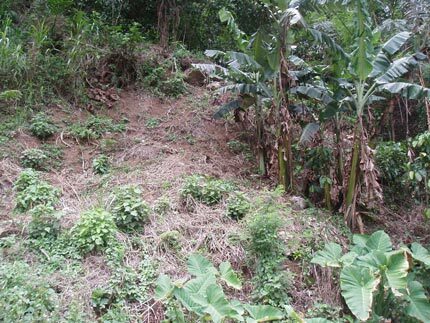 It does not take long for cultivated varieties of kumara to disappear: Wagner et al. note that only 24 of about 230 Hawaiian cultivars are still grown (Manual, p. 555); the attrition of Maori varieties has been even greater. 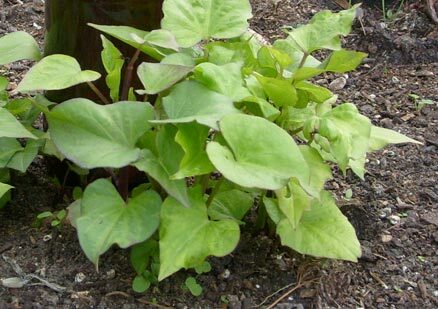 The linguistic evidence seems to hang on one word -- kumara ~ kumar, and the genetic counter-evidence on a sample from one plant -- Captain Cook's kumara. The jury is certainly still out on this question! 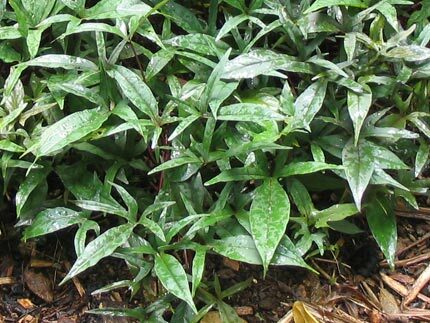 Māori traditional accounts agree that the plant was introduced to Aotearoa by people aboard the early voyaging canoes, usually by a notable woman specially charged with the task of ensuring its survival. Over the four to six hundred years the kumara was domesticated in Aotearoa, a large number of varieties were selected and cultivated. 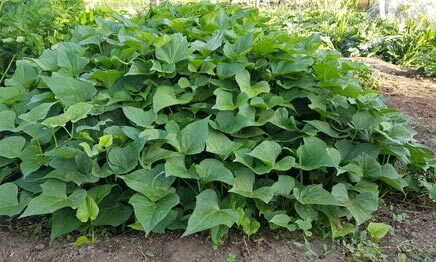 Some of these had names brought from the Eastern Polynesian homeland, and it is probable that the three which are also cognate with kumara names in Hawai'i were the names of early strains of kumara from which some of the others were developed. 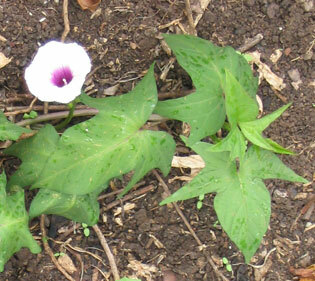 (The inset on the left pictures a Hawaiian variety in flower in the McBride Garden, Kaua'i.) 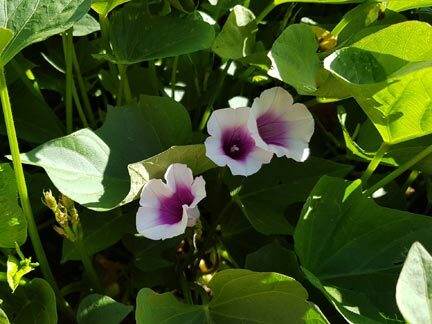 In New Zealand's present climate the kumara rarely flowers (I have seen it in flower here only once, in Russell in the early 1960s; in 2010 kumara flowers were again reported in parts of Northland, in Auckland in 2017, and in Nelson in 2019; photographs sent to us of the Northland and Nelson flowerings are in the galleries above and below). 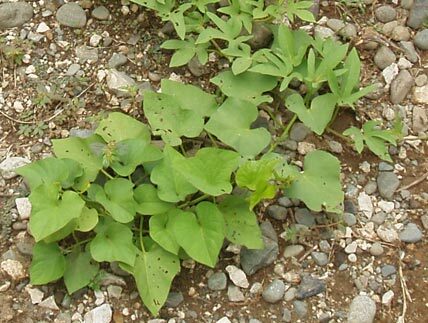 The climate may have been warmer when the kumara were first introduced so some of the new varieties may have been from locally grown seedlings (although, since even in Hawai'i the flowers are often sterile or the fruit capsules contain no seeds, this is unlikely), and others from the products of random variations carefully selected and reproduced for particular qualities. In additional to the older traditional names, more were coined for the late 18th or 19th century introductions. These included kaipākehā "foreign food" for new, mostly Mexican-derived kumara varieties in general, and waina ("wine") for a favourite, widely cultivated large variety. Although the etymological links between two of the names, kanawa and katoto, and their possible Polynesian antecedents are somewhat tenuous, they are interesting possibilities and worth noting nonetheless. Kanawa is the less likely of the two, as Māori would be the only Eastern Polynesian language to retain this word. The Proto Polynesian original was the name of a tree which was widely distributed by the original settlers, and probably carried into Polynesia from their Oceanic homeland -- the name had come down unchanged in form and virtually unchanged also in content from Proto Malayo Polynesian times. However in Proto Oceanic two other names also developed, and these are reflected in Māori, too. One of these is *ToRu, Proto Polynesian *tou, reflexes of which are the names for Cordia subcordata in most Polynesian languages: in New Guinea it is referred to as "kerosene wood" because of the ease and vigour with which its branches burn (although it is much more esteemed for its uses for carving - kou wood is also particularly important for this in Hawaii - and construction as well as the beauty of its flowers). The flamability is reflected in a possible Maori reflex tou "to kindle, set on fire". 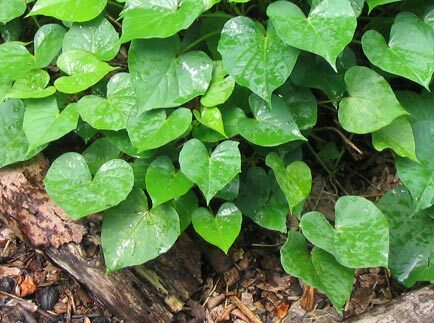 The other name is *jasi, which in Proto Polynesian became *tahi "heartwood, including that of Cordia subcordata". The black heartwood of Cordia subcordata is particularly strong and durable, just as the white sapwood is light and flammable. In Māori this is echoed in the compound words taiki and taikaha "heartwood" and taitea "sapwood". Given the metaphorical leap from a specific tree to one of its attributes applied to any tree undergone by words derived from *jasi, it is not impossible that a similar transformation turned the dimly remembered *kanawa into a kind of kumara in Aotearoa before the name had been completely forgotten in Eastern Polynesia. There is also another possibility, which does not preclude that just mentioned, connected with the shipment of kumara to Aotearoa on the Horouta canoe. It is recounted on the page about rauaruhe, the bracken fern. Proto Central Eastern Polynesian *katoto is also an interesting word. 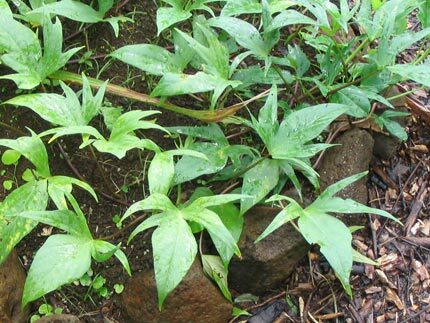 Almost everywhere it applies to a "Polynesian beach spurge", small coastal shrubs and trees belonging to the cosmopolitan genus Chamaesyce. The Polynesian species are endemic to Tahiti (C. atoto), the Cook Islands (C. fosbergii) and Hawai'i (15 endemic species, all of which appear to be most closely connected to C. atoto, and all of which seem to be known by the related names 'akoko, koko, 'ekoko and kōkōmālei). They are all members of the Euphorbia family and not obviously kumara-like, but plant names may be bestowed for quite tenuous reasons just to keep the name alive, so, again, the link between the Maori and tropical Eastern Polynesian words should not be dismissed out of hand. 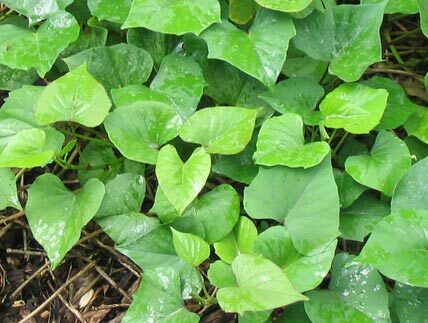 In addition to the kumara names certainly, probably, and possibly inherited from earlier stages of the Māori language's development, a host of locally-generated names has also been recorded, although unfortunately detailed descriptions are generally hard to find and most of the plants themselves have been allowed to die out. Thanks to the work of Dr Douglas Yen, a few were salvaged before they shared that fate and were sent to Japan for safe keeping more than 50 years ago. Those varieties are now being revived. The names recorded in the Williams Dictionary are noted below. These are the names and descriptions of the kumara varieties recorded in the Williams Dictionary of the Maori Language. Those linked by a tilde (~) are synonyms - different names for the same cultivar. "Dark coloured": manakauri ~ makakauri ~ matakauri. "Dark leaves and stem": konēhu ~ konehutai. "Dark skinned varieties": anurangi ~ anutai. "Red skinned varieties": panahi (small); para-karaka; taurāpunga; teterereia; toikahihatea; toromahoe. "Red varieties": kāwau; kohuorangi (small); kura (this variety was reserved for tohunga [priests] and ariki [paramount chiefs]). "Superior varieties": hītara; kōherehere (with wrinkled skin). Qualities unspecified: akakura, anutipoki, aorangi, arikaka,. hakinono ~ nonomea, häwere, hinamoremore, home, huiupoko ~ waniwani, hutihuti, ihipuku, kaeto, kahutoto, kaihaka, kaikākā (also tōtara heartwood), kaipo, kairorowhare, kakarikura, kanohi paua, kaoto, katokato, katoto, kakau, käuto, kautowhai, kawakawa ~ kawakawa tawhiti, kiokiorangi, kirikaraka, kōkōrangi, kōpaka, kōpūangaanga, kurarangi, kurawhakapeke, mākakauri, makatiti, makururangi, makutu ~ parakaraka, maomao, maori, māpua, maramawhiti, matatū, matawaiwai, maukura ~ torowhenua, mengerangi, mōnenehu, nehutai, nonomea ~ nonouri, ngakau-kuri, ngako-moa, paihau kaka, pane, pāpāhaoa, papahuia, parawaipuke, paretaua, pātea, pātōtara, pāuārangi, pāuātaha, pehu (also a variety of taro, and a variety of weaving flax), pio, pipiko-kauhangaroa, pōhutukawa, pokerekāhu ~ pokerekāhua, poranga, pounamu (also a variety of yam), puatahoe, punuiarata, purata, rangiora, raumānawa, raumataki, tānehurangi, taputini, taratamata, tārehurangi, tātairongo (also later applied to tomatoes), tokoū, tukou, tukau, tutae-tara, tūtanga, tutuhanga, ururangi, weni, wini (also variety of harakeke with a dark purple edge to the leaf), huiupoki ~ waniwani. After 1769, new varieties of kumara were introduced to Aotearoa by visiting navigators, expolorers, whalers, missionaries and other sojourners and settlers. Most if not all of these were from the larger and faster-growing "camote" (Mexican) strains which the Spanish had introduced to Southeast Asia, rather than the "kumala" (Peruvian and Ecuadorian) varieties. They were thus eagerly adopted by pragmatic Māori agriculturalists and displaced many of the until then traditional varieties. Many were given names -- one of these noted above, waina, was particularly favoured, and some of the names listed without further comment in the Williams Dictionary may also have been applied to one of these new varieties. Three varieties of kumara were listed as "Maori intellectual property" in the WAI 262 claim to the Waitangi Tribunal: hutihuti, rekamauroa and taputini. These were among those that had been collected by Dr Yen and sent for safe-keeping to Japan. DNA testing is currently being undertaken to determine during which period each of these varieties was likely to have been introduced to New Zealand. Rekamauroa (not listed by Williams or Johannes Andersen, another avid collector of Māori plant names) is probably one of the post-contact introductions. Another variety probably from this later period and conserved by Māori gardeners is now given the name poroporo (a Proto Central Polynesian name for certain species of Solanum, inherited by Māori). There is a photograph of the poroporo variety in flower at the end of the gallery below. ... there are dozens more! The Lyon Arboretum in Honolulu and other Hawaiian botanical gardens grow many "canoe" (i.e. traditional) varieties of kumara. As you can see from the illustrations below, they have huge variation in the appearance of their leaves -- the tubers are also varied. 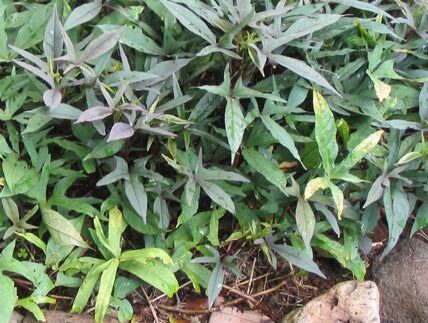 For comparison, four "Mexican" varieties are also illustrated, one we were growing as a ground cover, and another I photographed in two family gardens in the Mountain Province in the northern Philippines, where the camote was introduced by lowland traders from plants brought from Mexico by the Spanish colonizers several hundred years ago, along with a Māori variety with a heritage name, but probably also a nineteenth-century introduction, and finally the red-skinned variety now the most extensively grown commercial and home garden cultivar of kumara in Aotearoa. Since kumara so rarely flower in Aotearoa, we are fortunate to have two sets of photographs of flowering plants contributed by readers of our web pages. There are three photographs of a Māori heritage variety known now as poroporo (probably from one of the Mexican strains introduced in the 19th Century), in the gallery below. This variety flowered in the garden of Mrs Heather Martin, Omapere, Taitokerau,during the 2010 drought. 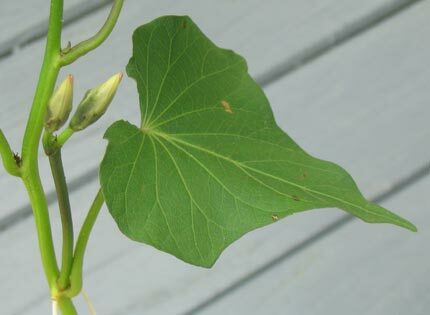 Subsequently, more flowers appeared, and twin buds and the resulting flowers are pictured below the first bloom.Kūmara also flowered at the Koanga Institute's Garden in the Kaipara district that year. In 2019 Damien Prendergast sent us a photograph of the widely-cultivated red skinned variety of kūmara in flower in his garden in Brightwater, Nelson. This is featured in the header section of this page. Further information : The monograph, The Sweet Potato in Oceania: A Reappraisal, edited by Chris Ballard, Paula Brown, R. Michael Bourke and Tracy Harwood (Sydney: University of Sydney Oceania Monograph 56, 2005), provides extensive discussions and information on the origin of the kumara and its dispersal and cultivation in the Oceanic region. The article in this book by the late Professor Roger Green, "Sweet potato transfers in Polynesian prehistory", discusses in detail the entry of the kumara and notes the evidence for its arrival in New Zealand early in this process, and in Easter Island much later. This widely-accepted scenario has recently been challenged by Professor Robert Scotland and colleagues from the University of Oxford, but their case at present seems to rest mainly on a single specimen of kūmara collected during James Cook's expedition to Tahiti, for the genetic evidence, and the well-established capacity of some other species of Ipomea to survive dispersal by wind and water to distant environments. The conclusions they draw have in turn been challenged by other scholars. The traditions, rituals and practices associated with the cultivation of the kumara in New Zealand are recounted in Elsdon Best's Maori Agriculture, recently reprinted by Te Papa Press, Wellington, and summarized also in Chapter XVI of volume 2 of Best's Te Maori, which can be perused on line at http://www.nzetc.org/tm/scholarly/tei-Bes02Maor-t1-body-d8.html. 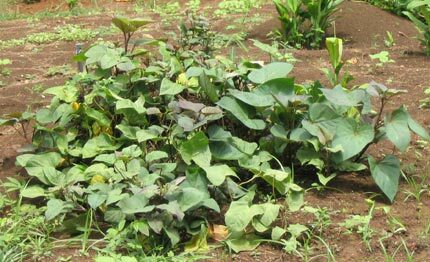 There is a comprehensive, 15-page profile of Cordia subcordata by J.B. Friday and Dana Okano in the "Species Profiles for Pacific Island Agroforestry" series, accessible on the web at http://www.agroforestry.net/tti/Cordia-kou.pdf. The Chamaesyce is described in the Cook Islands Biodiversity Database: http://cookislands.bishopmuseum.org/species.asp?id=5914. Photographs: The Omapere kumara flowers and buds were photographed by Mrs Heather Martin, and those of the Nelson plants by Damien Prendergast, who discovered them on the vines in their respective gardens. They very kindly sent pictures to us and have allowed us to use them here. The other photographs are by RB.